Green Goddess Veggie Dip Cups ~ healthy snacks to keep in the refrigerator for when the munchies strike, or super cute portable appetizers for your next party — and let’s just say that the dreaded communal dip bowl is now a thing of the past. I was put on appetizer duty for a friend’s barbecue today. She wanted to solve the problem of the appetizer table that sits untouched while all her guests spread out around the yard talking and drinking. She asked me to come with something more portable that people could take with them instead of being tethered to a table. I came up with these little veggie dip cups. I love them. They’re colorful and healthy, and they completely avoid the whole communal dip in the sun issue. I hate that. 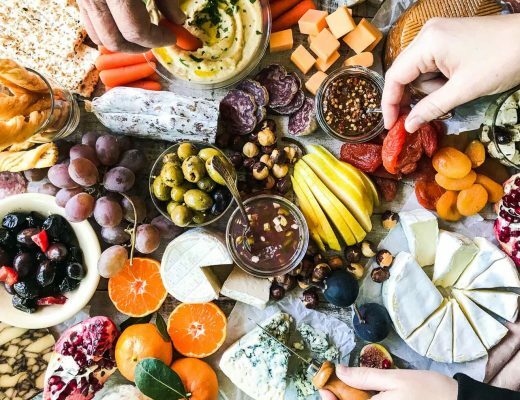 Everybody gets their own personal, portable, appetizer which makes for happy guests who are free to mingle…your parties just got 100% better. I started with a dip version of my homemade GREEN GODDESS DRESSING. I layered it at the bottom of each cup. Then I julienned the most colorful bunch of veggies I could find. Rainbow carrots, peppers, jicama, thin asparagus, English cucumber…anything that was crunchy and long enough to stack in the cup. For vegetables like asparagus and green beans I blanched them in boiling water for just about 30 seconds to take the raw ‘edge’ off, and then put them into ice water to stop the cooking and keep their bright color. Pop cherry tomatoes on the end of long toothpicks. TIP: Anchovy paste comes in a tube and lasts forever in the fridge. It doesn’t taste ‘fishy’, and gives the dip a wonderful flavor. The paste and the tarragon are key to the Green Goddess experience. Use plastic cups with high sides so your veggies stay put. The shape should flare out for easy noshing. Make sure to layer enough of the dip at the bottom, you don’t want your cup to run dry before all the veggies are gone. Make sure your veggies are fresh and cut thinly. Pay attention to color, and use a variety. To make the dip --- rinse your herbs well and put them in the bowl of a small food processor. Run the machine until the herbs are finely mined, scraping down the sides as you go to get all the herbs completely processed. This is going to give your dip that lovely pale green color. 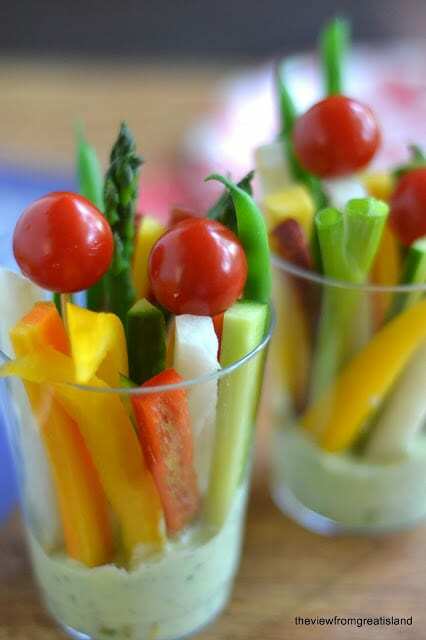 To assemble the cups --- peel and slice the veggies into sticks. Cut them to a length where they will just peek out from the tops of your cups when stacked. For tough vegetables like the beans and asparagus, plunge them in a pot of boiling salted water for about 30 seconds to a minute after it comes back to a boil. Then put them directly into a bath of ice water to stop the cooking and retain their bright color. Layer a little dip on the bottom of each cup. Then arrange an grouping of vegetable sticks on top. Keep cold and covered with a damp paper towel until ready to serve. Make it with your favorite dip. Use your favorite salad dressing, hummus, or guacamole. Make it ahead. If you slice up your veggies ahead of time, wrap them in damp paper towels to keep them from drying out. Don’t forget to pin these Green Goddess Veggie Dip Cups! Where did you find your cups? I find mine in my regular grocery store, Renee, and if you have a party store near you they’re great sources for all shapes and sizes of plastic cups. Amazon will have them as well. Love the idea. Where did you get the tumblers. I have not been able to find this size. This is an old post, Dara, so I don’t recall exactly where I got them,but I’ve seen them in other large grocery stores a lot. Any medium, slightly flared cup should work. I would SO love to see these on a table at a party. I’d be grabbing 2 just for me! Something so cool about individual cups of deliciousness. Easy to get your veggies in when you make it looks so pretty! 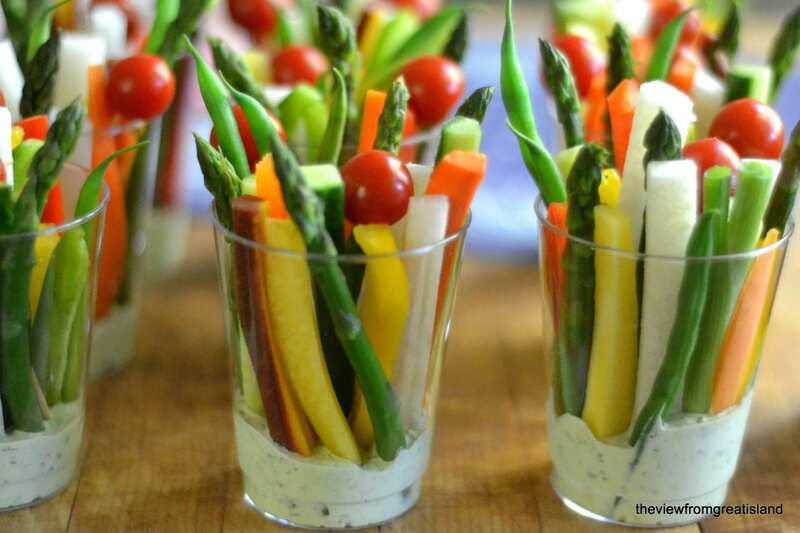 I’ve seen the veggie cups like this before, but I’m LOVING the asparagus spears and green goddess dip you’ve used here! I’m thinking these would be perfect for my son’s birthday party in July! Thanks Kelly, they really do work well for parties, especially outdoors. 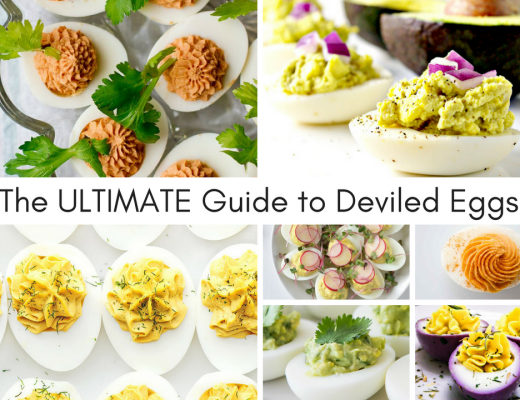 I think it’s ideal for kids — put some ranch dressing at the bottom! I agree, just put some ranch dressing at the bottom! These are so cute! My mother in law did something like this for our wedding reception but it was with hummus! That dressing sounds AWESOME so this would be so yummy! I’m planning a hummus version next! How many cups will this dressing recipe fill? 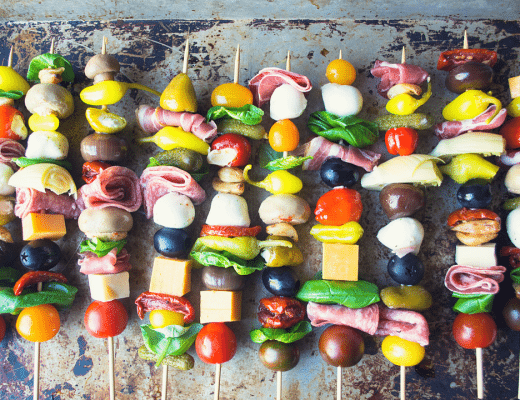 Absolutely LOVE this beautiful idea — perfect fresh summer party fare! What a great idea! And so pretty! Happy Holiday. I love it! Such a fabulous idea! It’s colorful and easy to handle! It would be fun to try with fruit & yogurt too! THIS IS ABSOLUTELY BRILLIANT! thanks very much.